I've made another Birthday card to share with you using a Gecko Galz Digital Kit called Parisian Garden. 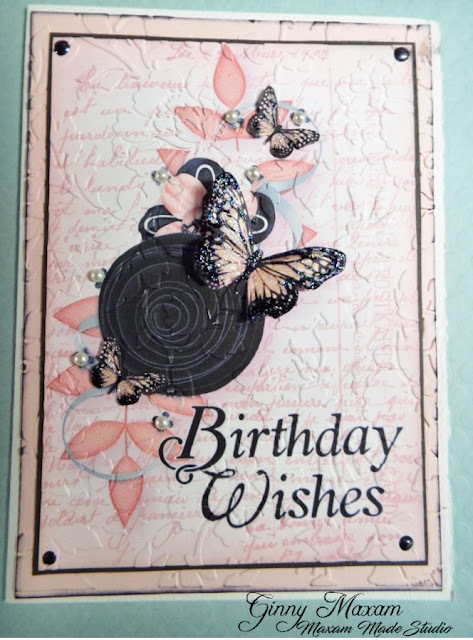 This card is really a lot simpler than it looks, I printed two of the images and fussy cut the butterflies. Best Glue Ever for the layers and holding the butterfly and pearls. Pink has not historically been one of my favorite colors to work with until this year. It is really great when you can feel your art changing, it keeps things fresh! Thanks for stopping by and check out the Geck Galz Blog, they have daily freebies! Beautiful Birthday card and you do the color pink so well !!!! Those butterflies are absolutely gorgeous! Love the pinks! I'd love for you to come by the new Cropstop blog and link up to our current party! What a beautiful card Ginny - so glad you were able to capture the sparkle on the butterfly wings. Thank you for the fabulous digi!